Although U.S. President Barack Obama has apologized, unrest spread to various parts of Afghanistan on the sixth day, Sunday, is associated with the Koran desecration at the NATO airbase at Bagram. Several protesters carried white Taliban flags. On the same day, Afghan Interior Ministry identified one of his employees as suspects in the shooting of two U.S. officers at their headquarters the day before - an attack that prompted NATO immediately withdraw their staff from the ministry of Afghanistan. A civilian was killed and 15 people were injured in the violence that also injured three policemen Sunday near a NATO base in Kunduz, northern Afghanistan, where an explosion which injured the Americans took place, said local police chief told reporters Qatra Samihullah. Anti-US protests have so far killed 200 people and wounding 30, including two U.S. soldiers were shot dead by a soldier in Afghanistan who joined a protest march in the eastern region of the country. Security sources identified Abdul Saboor, an Afghan police intelligence officer who was 25 years old, a suspect in the shooting of U.S. soldiers at close range in the Interior Ministry building in Afghanistan. The suspect has now escaped. The Taliban claimed responsibility for the attack, saying the shooting was done in retaliation for the burning of the Koran. In October, the Taliban vowed to fight until all foreign troops leave Afghanistan. President Hamid Karzai and its Western backers have agreed that all foreign troops would return to their country by the end of 2014, but the West promised to provide ongoing support after that time in the form of funding and training for Afghan security forces. Insurgents stepped up attacks on security forces and also the killing of politicians, including the killing Ahmed Wali Karzai, brother of President Hamid Karzai in Kandahar in July and peace envoy Burhanuddin Rabbani in Kabul in September. Escalating conflict in Afghanistan with military and civilian deaths reach highest level last year when Taliban violence waged in the traditional territory extends from the south and east to areas west and north of the former stable. A total of 711 foreign soldiers have been killed in the war in Afghanistan during 2010, making 2010 the deadliest year for foreign troops, according to an AFP tally based on independent website icasualties.org. The number of civilian deaths also increased, and the Afghan Interior Ministry announced that 2043 civilians were killed in 2010 due to Taliban attacks and military operations aimed at militants. Taliban, who ruled Afghanistan since 1996, fueling insurgency since ousted from power in that country by US-led invasion in 2001 for refusing to hand over al-Qaeda leader Osama bin Laden, is allegedly responsible for attacks on American soil that killed about 3,000 people on 11 September 2001 . 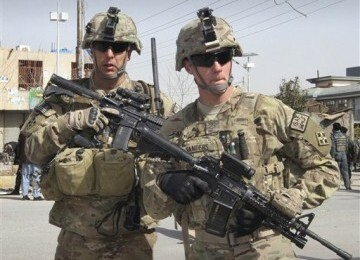 About 130 thousand personnel International Security Assistance Force (ISAF) from dozens of countries are in Afghanistan to help the Kabul government and its allies fight the Taliban insurgency. Around 521 foreign soldiers have been killed during 2009, which made the year as a year deadliest for international troops since the US-led invasion in 2001 and made the Western public support for the war drops. Taliban militants rely heavily on the use of roadside bombs and suicide attacks against Afghan government and foreign troops stationed in the country. Homemade bombs known as IEDs (improvised explosive device) resulted in 70-80 percent of casualties on U.S. forces in Afghanistan, according to the military.litary.